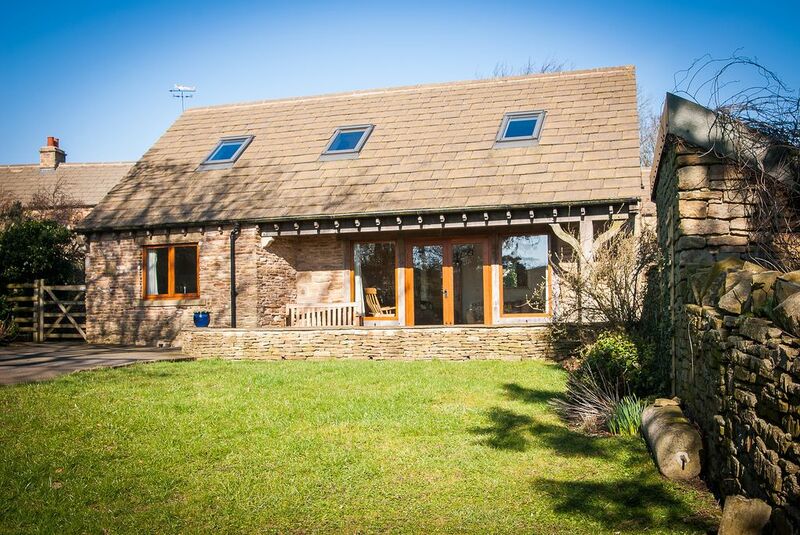 Everyone loves to stay at Aero Cottage, a recently converted two bedroomed, stone built barn conversion on the Eastern edge of the Peak District National Park. The comfortable and spacious accommodation has been sympathetically restored with a wealth of original features and high quality oak woodwork throughout. Accessed from a private gated drive with lawns to one side and a flagstone patio area with garden furniture and BBQ to the front, the barn offers a perfect, safe environment for children to safely play. Dogs are welcome and they have plenty of space to roam within the cottage garden. Aero Cottage is the ideal base for walkers and cyclists alike to explore this vast area with its stunning scenery and beautiful rolling hills and dales. There are walks right from the door and many designated cycle routes within minutes - we also have a secure lock-up for bikes. Spacious sitting room with comfy sofa overlooking south facing gardens TV, Dvd player. Sofa bed. Fully fitted farmhouse kitchen - electric oven and hob , fridge freezer, microwave, washing machine, dishwasher. Big Farmhouse kitchen table. A delightful cottage - very warm, cosy and spacious with everything you need, plus a large enclosed secure garden for the dogs. It was a delight to stay here and we will most certainly be going back. With so much on your doorstep to visit etc the cottage is well placed to take advantage of everything around the area. The bottle of wine, flowers and Aero chocolate awaiting us on our arrival were a lovely thoughtful touch and much appreciated. Can't wait to go back next year. Thank you for your review. We enjoy meeting new guests and we are happy to help and advise to make your stay a successful holiday. We're a family of 4 and loved Aero Cottage, we will be back! Incredibly spacious, really nicely decked out, garden is much bigger than you think and well enclosed. In a lovely quiet valley but close to Chesterfield and a lot of main haunts in the Peak District - found very easy to get to. Underfloor heating is lovely. Claire was a fantastic host, very helpful and friendly and we loved their eggs! You're not overlooked, lovely views from every window. Walks on your doorstep. Curber & Birken Edge only 5-10 mins drive away. Froggatt Edge not much further. Bakewell 20 mins away. Can't recommend this enough as a holiday location! Thank you so much for your kind review. We try to adapt according to our guests holiday requirements and make it a comfortable stay. A lovely cottage with very friendly owners. The cottage was very clean and welcoming when we arrived and had everything we needed for a lovely family holiday in Derbyshire. Highly recommended! We are a family of 4 with a dog and Aero has become our countryside bolt-hole. Aero is a cosy and comfortable cottage situated in a quiet location on the edge of the Peak District. We have visited the cottage on a number of occasions and it has always been extremely clean and well presented. Claire and John - the owners - pop in to say hello and when our children were little would take them to collect the eggs from the chickens - fresh, organic eggs for breakfast - lovely! Cosy in the winter when you just need to hunker-down and a beautiful quiet sun-trap in the Summer and a great patio for BBQ's! Fabulous dog walks and trips to Chatsworth House, their brilliant playground and their farm shop; excellent local pubs and an easy 15-20 minute drive to main supermarkets in Chesterfield. Millhouses Park (in Sheffield) is also a favourite for little ones for an ice-cream and a pedalo on the boating lake. Aero and its surrounding area has something to offer all age-groups. I would agree that the listing is accurate and there are no surprises (only good ones!). We're back in September! Thank you so much for this review. We are glad that it meets everyones holiday requirements if its a country style holiday you require. Booking Notes: Weekly and weekend bookings taken Other breaks may be available please contact owners with your requirements 30% deposit taken at booking with the balance payable 8 weeks prior to arrival. On line booking - owners website - Aero Cottage Changeover Day: Flexible Notes on prices: The prices stated are guide prices only and will vary throughout the year - short breaks are available - contact the owner for more information.